In rl I work with contemporary artists and many of them create installations. One could categorize their work as conceptual art. After a number of years working with this genre I’ve come to reappreciate more traditional arts, or, rather, craftsmanship. I’m eager to see the hard work, the time spent, illustrated in the construction of a work of art. The time an artist spends making offers insight into the working process in a way that conceptual art may often not. As I make my way around the galleries and museums of SL, I look with a rather critical eye at both virtual art and the presentation of real life art in the virtual world. When I heard the Smithsonian was sponsoring the Latino Virtual Museum I was excited to see what they’d produced. It’s the Smithsonian after all. Curated by Olga Herrera, the museum includes selections of paintings and archives from the Archives of American Art and other Smithsonian collections. 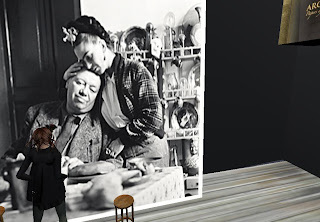 I ambled toward an oversized photograph of Frida Kahlo and Diego Rivera...and squinted. I refocused, cammed back and forth. Nope, still blurry. I tried out a few other images and they were all out of focus. The technology of SL allows us to dig deep, get close, immerse, and it’s up to the curators to ensure they take full advantage of the technology. It’s not enough to throw a photograph, or other object, into the metaverse for mere presence if it’s not useful to visitors. While the LVM provided much text about the image, they seem to have forgotten about the value of the photograph alone. I’d like to see the flowers in Frida’s hair, study the works of art hanging on the wall behind her, or the food on the table in front of her. One photograph has a hundred stories to tell and the curators should allow the visitor to make their own observations. The Smithsonian might take a look at the Dresden Gallery , a replication of a rl museum. The paintings are carefully rendered. Each is cataloged with basic, tombstone information. 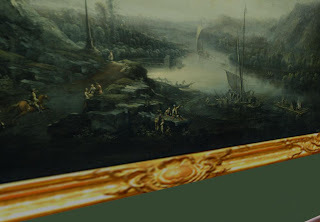 Almost minute details can be observed, as in this detail of a painting by Johann Thiele (The Elbe Sornewitz in Hoarfrost and Fog, 1741), making it useful for both the general browser and the scholar. 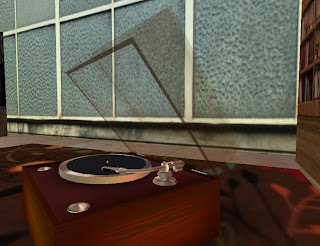 On the making of objects in SL - the real masters can be found in our 3D artists, like AM Radio, whose builds are thoughtful replications of real life things always elegantly assembled. 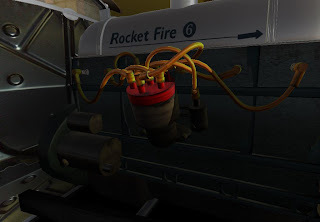 Just look at the swirling hoses on this engine.